George and the girl pushed the boat into the surf and climbed aboard. The girl took the tiller, guiding the boat out as the tide pulled them further from shore. The boat hardly seemed to need anyone to steer it, though the girl kept her hand on the rudder just in case. The boat sailed for days, until nothing was visible except sky and sea. There was nothing else in sight, no signs of another living soul or even that anything else existed in the world except for the water and the air. 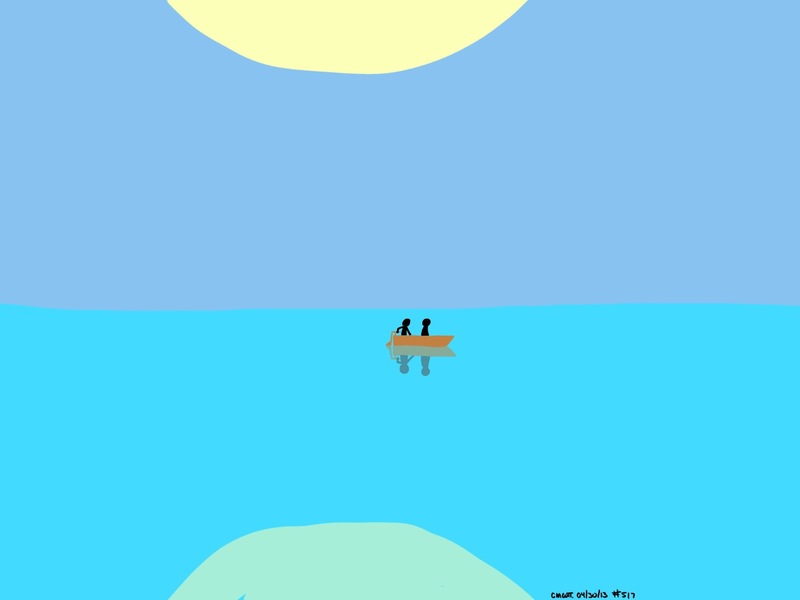 The boat became their entire world, a floating pebble in a galaxy of blue. After what felt like two weeks, a sliver of something not blue appeared on the horizon. Eventually, the sliver grew to become a shoreline, with trees and sand dunes visible. The boat scraped against sand, and George and the girl clambered out, splashing through the last few feet of surf to reach dry land. They dragged the boat up onto the sand behind them, leaving it beached as they lay out on the dry expanse next to the sparkling ocean. “So, where are we going?” George asked,staring up into the empty sky. “Wherever the journey takes us,” the girl replied quietly.